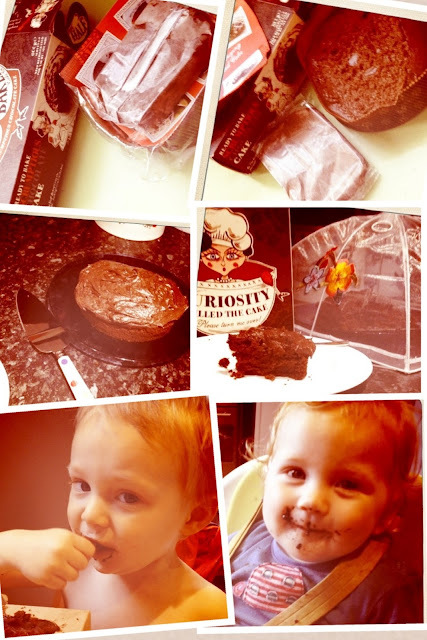 Emma in Bromley: The half-baked cake review! I love baking cakes, that's no secret, but I do lack two things, a good mixer and time! In less than a month, I had the demands of making my daughter, Maegan's christening cake, a birthday cake for Blake's 3rd birthday and a cake for Maegan's first birthday. The christening cake was good, all homemade- but not quite the finish I had anticipated. Blake's birthday cake was chocolate homemade tasty mess covered with smarties. But poor Maegan, we ran out of time and I couldn't get anyone to babysit just for an hour or so, so I couldn't make her cake - it ended up being lovely, but shop bought M&S cake. Not what I'd planned for my daughter's first birthday! If I'd have known about Half-Baked cakes then, I'd have certainly have had one of those instead! It's a welcome helping hand! I was sent a scrumptious chocolate Half-baked cake to review recently and I'm in love with the brand already! They are a new brand and the concept is all about readymade cake mixture, they use good ingredients such as free range eggs and real butter. The cake comes ready to bake! All the time consuming jobs have been done for you. I love making cakes with Blake but sometimes we just don't have the time with Maegan being at the "handful" stage where she's just climbing everything it's hard to keep her safe and supervise Blake at the same time. We also have a space issue - we just don't have to room to spread out all the cake making stuff! I love baking but I just have to many obstacles at the moment! With Half-baked it was literally as simple as putting on my pretty pinny (pinny is optional by the way), opening the box and popping it in a preheated oven! There are clear instructions both on the box and on an inserted leaflet - the leaflet also has diagrams and instructions to help get perfect icing too! Blake kept asking if the cake was ready every 5 mins and was very excited when it was time to get the cake! It was just a case of running a knife round the inside of the paper case and then peeling it off carefully. I popped the cake on a cooling rack and once it was cool, I spread the chocolate butter cream all over the top - this was also all ready prepared! I tried to get the cake to last - I wanted to see how long it would keep for but after 2 days there wasn't a single crumb left! I think 2 days was a record really in a house full of chocoholics! The Half-Baked cake looked, smelled and tasted like a homemade one, it really didn't feel like cheating and I still had a sense of pride - and with a whole lot less washing up to do too! It was a nice easy lovely treat - a nice fresh home baked cake! We had our scrumptious chocolate cake as a treat with tea on Sunday afternoon and it went down well, even Maegan tried some! I liked the "curiosity killed the cake" design on the base of the box - made me giggle with its cheeky little message! Half-Baked cakes are currently available in four flavours, farmhouse apple, lemon & lime drizzle, coffee & walnut and scrumptious chocolate from selected Tesco stores with and RRP of £5 and can be found in the chilled food aisle. The Half-Baked website has lots of video tutorials and competitions so worth a little nosey! Great idea and already on my shopping list!